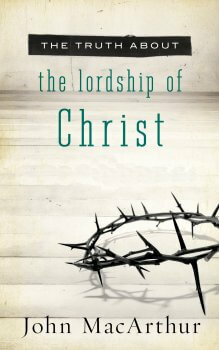 John MacArthur’s book, The Truth about the Lordship of Christ, is a tiny book with a huge message. Unlike many other ‘basic’ books for Christians, this book doesn’t water down the truth of the gospel of Christ in the slightest, something that’s becoming harder and harder to find, unfortunately. But this book almost makes up for all of the deficiencies of the others. Christ seeps out of every pore of this book. At first, you’d think that a simple book about how Christ is Lord wouldn’t run too much into the basic gospel and what the faith is all about. But you’d be wrong, because as MacArthur shows, Christ as Lord is the central truth of the faith of Christianity. Rather than being a boring doctrinal book, this book is alive and breathing, filled with the Word of God and life-changing, if not new, ideas about Christ. It’s sad that a book with the pure, straight Gospel in it is considered so radical. As MacArthur so accurately pinpoints, the Gospel has fallen out of our lifestyles as Christians, “The norm is not to let Christianity disrupt your lifestyle.” His book revolves around countering — no, destroying — this perception. MacArthur cuts out this avoidances of the heart of the matter; enough of the empty Christianity and the unchanged lives. This book is a close, clear, Biblical look at what the Gospel is, what it does to us, and what humans changed by the Gospel look and act like. It’s not boring, it’s not Sunday morning services, it’s the straight, clear Gospel that changes peoples’ lives and glorifies God. There lies the second thrust of MacArthur’s book. Our attention is too fixated on ourselves. It’s not about us: it’s about glorifying God. MacArthur makes this very clear, “But as important as fellowship, teaching, and praise are, the primary motive of the church is to glorify God. The apostle Paul described salvation as being “to the praise of the glory of his Grace” (Ephesians 1:6).” This ties in totally with his previous message: we’re changed not for ourselves: we’re changed to glorify God, we’re changed so that we can glorify God. What makes this book truly great, though, is not its solid subjects and teaching on them. This book is filled completely and totally with passion. When MacArthur talks of being changed by Christ his own life is obvious as an example. He’s a fellow human who’s been totally changed by this and wants — needs — to share it. And it’s not just MacArthur rambling on some stuff he thinks he’s qualified to speak on (unlike some other authors): this is all straight from Scripture. Bible verses are used as punctuation marks, and in a completely excellent way. MacArthur isn’t trying to use the verses to back up his argument: the Bible is his argument. Overall, MacArthur’s book is refreshing and sorely needed. It’s firmly grounded in scripture when most Christian books are not. It’s firmly grounded in the Gospel while the chuch is drifting. It’s firmly grounded in God, not in Man. Best of all, it’s firmly grounded: there’s no polite stepping around or avoidance of ‘uncomfortable’ topics. It’s a real book for real life, and I highly recommend it. MacArthur isn’t trying to use the verses to back up his argument: the Bible is his argument. That’s my favorite things about MacArthur books. Great review.